There is almost always one enigmatic person at every gathering, whether it be a bar, venue, or house party. Inevitably, there is an expert storyteller there as well. With any luck, it happens to be the same person. These rare folk have the ability to spin a tale you have possibly heard before but can retell it with such clarity that you are captivated or better yet hypnotized. They can give you a new understanding of something you thought you already knew. This is a beautiful power and an ability that is rare to possess. Catherine Sikora is such a person/player. She has a clean and colorful voice that could read me my autobiography and still have me in suspense. 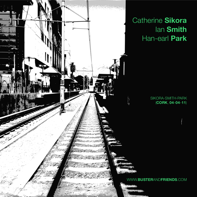 Sikora and trumpeter Ian Smith, both Irish, are joined by American guitarist Han-earl Park to complete this trio for a night in Cork, a night that was fortunately recorded for this release. Topologically Correct Harry, starts the album on a timid, feeling out sort of an arrangement with Smith and Sikora not being overly committal. Park stays low key and adds a percussive element to the proceedings. There is something really refreshing about a trio allowing silence to be their forth member. Sikora is in such control of her saxophone, as every note has a purpose, every note an adjective. The main story on the recording is track three. Clocking in at almost 25 minutes, Red Line Speed, is, to continue a theme here, the Shakespearian tragedy of the album. It starts with the chatter of a couple sitting at a table close to one of the microphones. The guitar comes in but the conversation continues in the background. Park changes up his percussive touch and somehow gets his guitar to sound like a tuba of sorts. The trumpet is next, adding to the subplot. By the time Sikora joins in, the stage has been set for quite the journey. The track builds slowly with no lack of intensity until the half way point when both Park and Smith drop out and let Sikora have her monologue. She effortlessly takes away the familiar tone and replaces it with nothing more than the air that she breathes, until there is nothing. Even the chatter of the patrons have stopped. Then out of nowhere comes a cry from the saxophone. A cry for help, a cry to let us know that it didn't end as badly as we thought. The others jump in to help and push the track to its conclusion. This number really is an experience to remember and worth every minute of dedication it takes to hear it in one sitting. We did in fact do a couple of double reviews before. However our team was so small we struggled jut to keep up with the number of records received. With the new reviewers we now have a chance to (sometimes) have double reviews. We plan to continue with these whenever possible, in fact there are already a few scheduled ... so keep your eyes open! As for hoping the reviewers might have had more opposing views, this may be more difficult. One of the policies we have for reviewing is that no one is obliged to review a record. If you don't enjoy it ... pass on to another. Hence if you don't see a album reviewed here, we either haven't heard it, or didn't like it enough to review it.